Borgo Panigale (Bologna), 13 December 2014 – The millionth Ducati to come off the production line at the historic Borgo Panigale factory has been handed over to one lucky client directly by Claudio Domenicali, CEO of Ducati Motor Holding. The event took place on Friday 12 December at the Audi City Lab – an exclusive temporary show room set up for the Christmas period in Via Montenapoleone in the centre of Milan. The client, Ernesto Passoni, a 47 year-old from Cinisello Balsamo near Milan, has always been a Ducatista and now, awaiting delivery of the bike he ordered from a dealer, he was told that his would be the millionth Ducati to be produced. 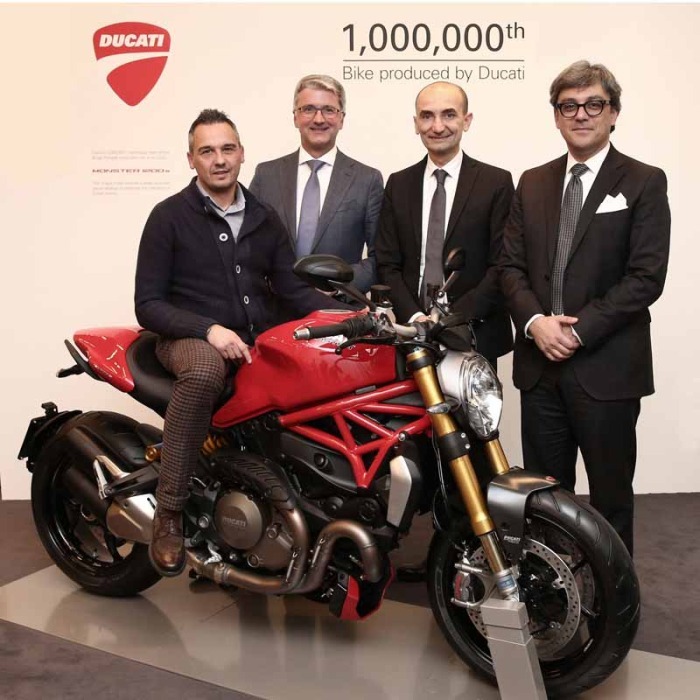 His loyalty to the brand was rewarded with the added value of a special customisation and a presentation ceremony in the presence of Audi and Ducati top management. The Monster 1200 S, customised with a laser serigraph on the top handlebar bracket showing the chronological number reached by production at Borgo Panigale, was personally presented to Mr Passoni by Claudio Domenicali, CEO of Ducati Motor Holding. Prof. Rupert Stadler (Audi Group CEO) and Luca de Meo (Member of the Board for Marketing and Sales, Audi AG) were also present in Milan on occasion of the Audi City Lab. The important milestone was reached with a Monster 1200 S, the iconic “naked” that identifies the brilliance, originality, technology and style of Ducati twin-cylinder bikes all around the world. It is a bike that has written a fundamental chapter in the Italian manufacturer’s history book, and one that today sets a further landmark for Ducati. The first Ducati Monster was presented in 1992 at the Cologne trade show; an original and extraordinary example of a bike capable of blending a few simple elements to become an object of design rather than just a bike, a prototype that would become a true icon. Ducati continues to develop the family with the latest generation of this very successful model that has been adapted and reinvented over the years, becoming the first point of reference for customisation and personalisation and influencing the entire global motorcycle scene for more than two decades. The Monster 1200 is equipped with the extraordinary 1198 Testastretta 11° DS engine, derived from the Superbike. The advanced technology of the braking system, suspension, single-sided swing-arm and wheels is combined with ground-breaking ergonomics, to offer the most seductive, high-performing and versatile new Monster ever seen. The Monster 1200, extremely comfortable also thanks to an innovative seat height adjustment system, is equipped with 8 levels of traction control, 3 levels of ABS and 3 levels of Ride-by-Wire, linked to the Ducati Riding Modes that can be selected using the indicator. The Monster 1200 is offered as a 135hp 1200 version and as an exclusive S model, with 145 hp and 12.7 kgm of torque, that enhances riding pleasure thanks to powerful acceleration, a benchmark chassis and a dry weight of just 182 kg.